At that time my friend Nibaran, a disciple of Holy Mother, arrived. I decided not to go to work. Accompanied by Nibaran and my younger brother Dulalshashi, I went to the Ahiritola ghat, crossed the Ganges by boat, and then reached Belur Math at 10:00 am via Salikha (Salkia) and Ghusuri. It was raining a little. I saw that Rakhal Maharaj (Swami Brahmananda) and some monks were busy decorating a cot with flowers in the western veranda of the Math building. When Rakhal Maharaj saw me, he burst into tears. His voice was choked, so he pointed to the steps and indicated that we should go upstairs. When I entered Swami Vivekananda’s room I saw that his divine body had been laid on a carpet. His forehead was smeared with holy ashes; a bouquet of flowers was placed near his head; and his body was covered with a new ochre cloth. His right hand was resting on the floor and a rosary had been placed around his right thumb. His eyes were indrawn and half-closed like Lord Shiva in meditation. The entire room was full of fragrance from incense burning at both sides of his body. Sister Nivedita was seated at the left side of Swamiji’s body, steadily fanning his head with a palm-leaf fan. Tears were trickling down her cheeks. Swamiji’s head was placed to the west and his feet to the east, towards the Ganges. Grief-stricken, Brahmachari Nandalal sat silently at his feet. We all three bowed down to Swamiji, touching his feet, and then sat there. When I touched his feet, they were as cold as ice. Nivedita listened to these songs with all her attention. Pent-up emotions overflowed from her heart and began to flow from her eyes as tears. It was an unforgettable and sad scene; I shall never forget it. Although the incident occurred forty-five years ago, still its memory is written on my mind in golden letters. On that day the expression on Nivedita’s face told me how wounded was her lost and sad heart! It truly stirred my consciousness. I realized that her reaction was not the result of mere emotional weakness. Where is this great, learned, spiritual English woman full of renunciation and forbearance, and where are we who are proud of a little learning and devoid of renunciation! At about 1:00 pm Swami Saradananda came upstairs to Swamiji’s room and said to Brahmachari Nandalal and the three in my party: ‘Look, we are broken-hearted because of Swamiji’s passing away. We have lost all our strength. Would you be able to carry Swamiji’s body downstairs?’ Immediately Brahmachari Nandalal and we three devotees slowly and carefully carried Swamiji’s body down the steps to the lower veranda and placed it on the cot decorated with flowers. As was the custom, some pomegranates, apples, pears and grapes were offered to Swamiji. Swami Advaitananda then said to the brahmachari, ‘O Nandalal, Swamiji loved you immensely. You perform the last worship to him.’ When Swami Brahmananda and the other monks approved this proposal, Nandalal performed the ritual offerings of garlands and flowers, and of fruits and sweets, then waving an oil lamp and finally chanting a hymn. It was proposed that a final photograph of Swamiji be taken, but Swami Brahmananda would not allow it, saying, ‘There are many good photographs of Swamiji; this sad picture will break the hearts of all.’ Afterwards, Swami Brahmananda, the other monks and brahmacharins offered flowers at Swamiji’s feet. Finally, Haramohan Mitra (a classmate of Swamiji’s) and other devotees offered flowers. Later, Swamiji’s feet were painted with red dye (alta) and footprints were made on small pieces of cloth. Sister Nivedita also took a footprint on a new handkerchief. I took a beautiful rose (not fully open), smeared it with sandal paste, touched it to Swamiji’s feet and put it in my front pocket as a memento. When the worship service was over, Swami Saradananda asked the same four of us to carry the cot to the spot where Swamiji’s body would be cremated. All the monks and devotees followed the procession. There had been some rain before noon, so the monastery ground was wet and slippery, and moreover it was covered with spear grass. So we slowly and cautiously crossed the vast area and placed the cot on the funeral pyre set with sandalwood. 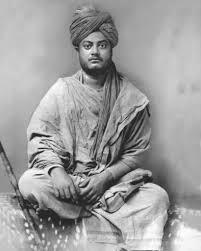 At that time Swamiji’s aunt and his cousin, Habu Datta, arrived by car from Simla (Calcutta), and began to cry and lament loudly. Swami Saradananda then asked everyone, ‘Please take a bunch of pankati [the dried stalk of the jute plant], ignite it, circle Swamiji’s body seven times, place the blazing pankati under the cot just below Swamiji’s feet, and bow down to him.’ According to his instructions, Swamiji’s body was consigned to the sandalwood fire, and the grief-stricken monks and devotees sat like statues around the blazing pyre. The funeral fire gradually rose high, extending its many lolling tongues to consume Swamiji’s body. Girish Chandra Ghosh, Upendranath Mukhopadhyay of the Basumati, Jaladhar Sen, Mahendranath Gupta (M), Akshay Kumar Sen and other devotees were seated on a cement bench near the bel tree and watching this heart-rending scene. At this, Nivedita could no longer suppress her grief. She got up and began to circle the blazing funeral pyre. Seeing her close to the pyre, Swami Brahmananda was concerned that her skirt would catch fire. He conveyed this to Swami Nirbhayananda, who then took Nivedita’s hand and led her away from the pyre. He made her sit on the bank of the Ganges and tried to console her. The sacred fire and a favourable wind consumed the lower part of Swamiji’s divine body to ashes within a short time; but amazingly that fire did not touch his chest, face and the hair of his head. His facial expression and the look of his broad eyes were beautiful. It was suggested that someone shake Swamiji’s body so that it would burn quickly. This greatly upset Swami Nishchayananda, a disciple of Swamiji. He did not want to see his guru’s body prodded with a pole. So he immediately climbed up an old tree nearby, cut some branches and set them on the funeral pyre. Meanwhile, Swami Brahmananda took me aside, gave me a ten-rupee note, and said, ‘You and Nibaran take Girish Babu’s boat, cross the Ganges and buy some sandesh [sweets] and other kinds of food from Baranagore Bazar. From last night on, no monk put anything in his mouth – not even a drop of water – and some devotees are also fasting.’ When Bipin Saha of Baranagore saw us going to carry out Swami Brahmananda’s order, he joined us. He contributed five rupees and asked a confectioner in Baranagore Bazar to prepare hot luchis [fried bread], kachuri and sandesh. He then carried the food basket on his head and returned to Belur Math with us. It was evening when we returned to the monastery, and the funeral pyre had been extinguished. Swamiji’s remains had been collected, and the monks and devotees were bathing in the Ganges and making water offerings. There were no worship services that day. Vespers were conducted that evening and food was offered to the Master at that time. Prasad [offered food], tea and water were then distributed among the monks and devotees. Afterwards, the grief-stricken devotees returned home. At 10:00 pm Kali Puja began in the upper shrine room of the monastery. Ishwar Chandra Chakrabarty, a Tantric adept and father of Swami Ramakrishnananda, performed the worship. Monks and brahmacharins bowed to the Master in the shrine and then meditated in Swamiji’s room. Before that, when the evening food offering was over, Swami Brahmananda told Swami Premananda, ‘Please give prasad to Bhupen and these two devotees; but the rest of us will fast.’ After having prasad, we three lay down in the large room downstairs in the western part of the Math building. That night, Swami Nityananda (an elderly disciple of Swamiji) occasionally made loud and pathetic cries that reverberated throughout the monastery. At 3:00 am Swami Saradananda came to our room and woke us up. He asked us to go to the room upstairs. There Swami Brahmananda asked me to purify myself by sipping some water and to repeat my mantra. After a while Swami Brahmananda asked everyone present to go to the western courtyard where the homa fire was arranged. We joined the monks and sat around that sacred fire, repeating our mantra. After the homa fire, we all went to the spot where Swamiji’s body had been cremated, circled it seven times, and bowed down. Everyone then sat under the bel tree for a while and repeated his mantra. Finally, all of us went to the Master’s shrine and bowed down to him, and then took prasad downstairs. Oh,as if I am witnessing swamiji’s mahasamadhi’s moments right now in front of my eyes.